Scenes in the public life in Trinidad and Tobago have become so unreal that I have been listening to Brother Valentino’s “Life is a stage” to re-digest his opinion that in Trinidad and Tobago we live in a never-ending movie in which we all have a role to play. 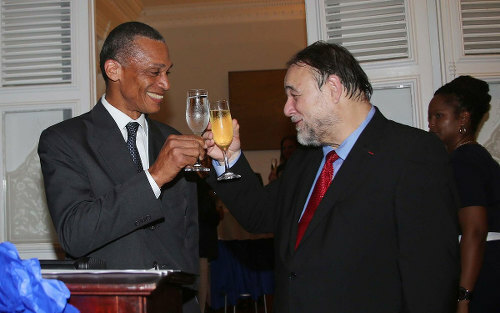 Photo: Foreign Affairs Minister Dennis Moses (left) toasts with His Excellency Hedi Picquart, then Ambassador of the French Republic, on Bastille Day 2017. Around the same time, Darryl Smith was in a ministry, then out, then halfway back in. 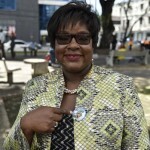 Then he was out again and very many people are relieved that he won’t be getting to the bottom of things as Junior Minister in the Ministry of Housing, to which he was reshuffled on Monday last and fired the next day. 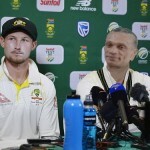 As Brother Valentino has said, “This place have some scenes that we could go off on.” This was certainly one such scene and countless memes flourished to help force Smith’s dismissal—to which I return below. I first return to Brother Valentino’s calypso, prompted by a scene outside of the Hall of Justice. There is a no parking zone the length of the block in front of the Hall of Justice, at least designated as such by white paint in capital letters. It used to be that lawyers would be dropped off there, as no one dreamt of parking there. Now, vehicles are parked long-term in that area—marked ‘No Parking’—and I have not seen the tyrant wrecker active there. 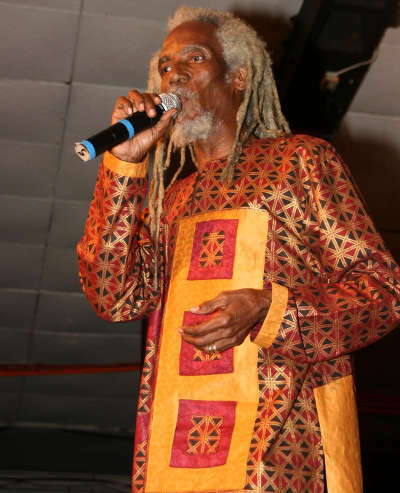 Photo: Iconic calypsonian Brother Valentino. I noticed last week that one vehicle was left so comfortably there that the driver had unfolded the sun visor along the dashboard. It is very “This is Trinidad” that a no parking prohibition outside the Hall of Justice—a significant symbol of law enforcement and order, and presumably a well policed building—should be ignored. Adding to the unreality when I was there last week was the sight of a gaggle of traffic wardens and uniformed policemen outside of the Magistrates’ Court a block away, not noticeably managing road traffic. It is distinctly possible that the painting of No Parking on the road outside of the Hall of Justice was just the role-playing of a traffic management or Judiciary official, unsupported by the making and publication of the relevant traffic regulations. The point about all of this is that we have developed the job descriptions and bestowed all the powers and trappings on persons to run the country but it is just a role they are playing. The portrayal that we have government whereas governance and regulation is frequently all we have; a mere portrayal, while the performance of those vested with responsibilities and efficiency, fairness and propriety is lacking. Additionally, we accept these unrealities and play supporting roles in the madness—whether we are “scavengers or dem barristers or dem doctors and lawyers” or the road painter putting down words not really to be obeyed. 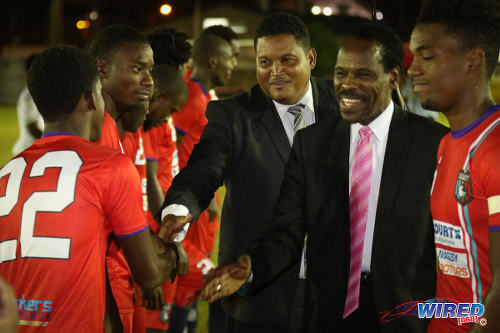 Photo: Then Sport Minister Darryl Smith (centre) and Minister of Public Utilities Fitzgerald Hinds (second from right) meet players from Morvant Caledonia United before kick-off against W Connection at the Hasely Crawford Stadium training ground on 20 January, 2017. The Government tried to shield and defend Smith by spin after spin. Pretence, portrayal and role playing was strong. At least one Cabinet member loudly defended the use of a non-disclosure agreement as “normal” when the accuser is paid a settlement, even though the source of the settlement funds is presumably public money. Now there is to be an inquiry by a committee into the circumstances surrounding the payment. The repeated appointments of investigators and committees are pointless. Are they just part of the game? Will the dodgy spinners at Cabinet level also have to be re-shuffled? It truly is a never-ending movie. 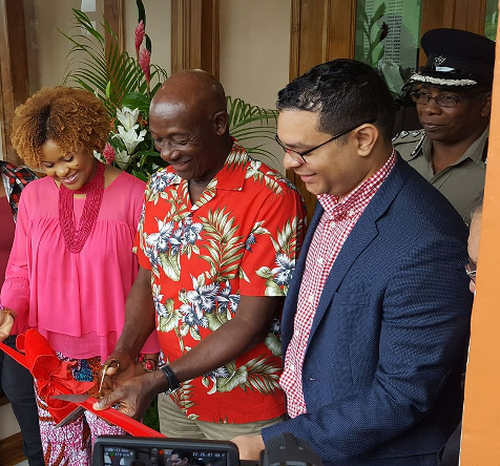 Photo: (From left) Culture Minister Dr Nyan Gadsby-Dolly, Prime Minister Dr Keith Rowley and Housing Minister Randall Mitchell open a homework centre in Carenage. A tief to protect the TREASURY. 76. Patrick Manning use of a licence plate bearing the nation’s Coat of Arms on the Prime Minister car. 77. 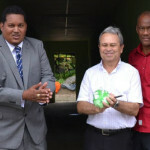 DAWI Services Ltd ( Dane Wilson ) awarded $4 Million to construct Bagatelle Community Center. NO CENTER BUILT! 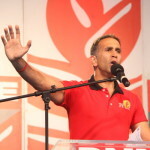 A Careful check will show almost $25 Billion in Scandal under the PNM 2002-2010 Information provided and Credit must go to Mr. Hucil George. Then throw your hat in the ring or shut to eff up and enjoy the ride . What the fowl foot this man writing about trappings and power? ; He fully well know that he possibly makes in one week what the PM makes in one year and he has the gall to tall about trappings? As far as power goes, he also knows that no minister can fire a public servant in this country because the public servants don’t work for them – they work for the Perm Secretary. Their limit stops at policy-making while the operational aspects are under the line authority of the PS. So, as usual, he is just being deceitful self while all the time representing large corporations against labour for tons of cash. 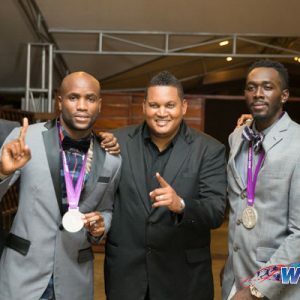 Martin Daly has been sharing his column with the Trinidad Express AND Wired868 for over two years I think. If you think that we somehow coerced Daly into taking a particular line that is exclusive to Wired868’s supposed ideals… I don’t know how to put it diplomatically… You’re an idiot and as intellectually impressive as an empty tin can. Granted I’d admit that I might have responded to that silly comment of yours differently if it wasn’t on the same day that Manchester United handed the Prem title to Manchester City by losing at home to the team on the bottom of the standings… ? Lasana Liburd , is that the best comeback you could come up with. Bro, you really didn’t get out much when you were younger, did you? Nevertheless, no one said anything about you coercing anyone. You simply show your slip every week by supporting anything negative being spewed by these guys. Certain opinions don’t worry me one jot. We are focused on reasonable readers. Just to be clear: We welcome ALL readers but will not waste time responding to those who really have contributed nothing and really have nothing to contribute. You mean ones which reinforce your bias and those with whom you “share your space.” Anyway, don’t forget that the public is still awaiting the in-depth investigative report on the sweetheart deal between your colleagues in the media and the TTFA (It seems like the money in brown bag and housing stories have been killed by you guys). Roger, did you think about your response before rushing to the keyboard? I ask this question because you seemed to have given little or no thought to what Daly is/was saying. What exactly are you angry about? From your comments, you seem to be jealous of Daly’s apparent earnings and wealth. And that is all. You resent the view (yours only) that he represents ‘large corporations against labour for tons of cash’. I wonder… will you have the same resentment against a cardiologist who wants to charge you $200,000 or more to do a bypass on you or your relatives? I don’t know… how do you know what the costs are for the operation? Are you are your payments have to cover theatre time, equipment, staff, expertise etc? In the same way, a lawyer charges for his expertise, not to mention he has a staff to pay who, more likely than not, help him do research, prepare papers and so many other things necessary for the best representation he can provide. If large corporations can afford him and are willing to pay his price, why should he turn them away? He has to provide for himself, his family and usually families depending on him… staff, if you forgot. People like you usually argue from a position of ignorance… and I mean that in the kindliest of ways. You don’t know the factual circumstances of the individual or his client. But that does not stop you bleating like a sheep. Here’s the rub… I bet if you have a legal problem, you’d be happy to have him represent you. Why? Well, his reputation is built on performance over decades, so you’d be glad to have MARTIN DALY on your side. Don’t rush to refute… you will want to argue nay, but in your heart of hearts, if you’re honest with yourself and others, you will find yourself agreeing with me. Another thing you forget is the amount of work and hours spent by lawyers studying to get where they are. Same as doctors. Why should they give away their services for free? I alone know what umpteen hours I spent, huddled under a blanket till 3 or 4 am reading and studying, night after night, to get where I am. No one helped me. My effort is my own. Do you deserve my free labour? I think not. Neither will ANY other professional unless he can “afford” to give you a ‘freebie’. The fact of the matter is that many professionals spend so many hours on their craft, and on preparing for their clients that when one thinks of the payment per hour, it amounts to little more than a bare profit after expenses. That is economic reality. Another point is that you have missed completely the factual aspect of Daly’s column. Where in it do the facts appear to be untrue? Trappings of power? We all see it every day. From the time they become Ministers or receive a high (and I use that word advisedly) position, we see them rushing to buy new cars, fitted with ‘blue lights’ and the latest gadgets. They bypass the ordinary man on the street as a bother, steupsing at any interruption of their self-aggrandising speeches and publicity. Not to mention, every Smith and Balgobin, indeed we can add Rowley in there, use their ‘fame’ to make women feel like mere toys put around them for use, abuse and sexual pleasure. There are so many examples in the public domain, it provides evidence that this is a norm rather than an exception. Lest you be accused of Carmona’s ‘rum shop’ or ‘donkey cart’ logic, learn about critical thinking. Weigh up the arguments before engaging your keyboard. Look at both sides, and remove the emotions you have for ‘arguing your side’. Biases and emotions really can’t beat a sound reasonable argument. Nothing will wake them up to the security risk faster than another coup or bombing. Trinidadians are an apathetic, lackadaisical bunch. Of course not. It’s jobs for the ‘boys’ as I expect they get paid for the additional duties. Spread the wealth around. Martin Daly writes in his column what I have been on fb posts: “performances and theatre by poseurs” ‘ the resurrecting of the dead’, ‘ the hiring of the dead’ and other architectural impossibilities.